Ever wanted to make caramel apples in a group, but still make your very own apple by yourself and exactly the way you want it? This easy recipe keeps the caramel in individual portions and the toppings readily accessible to everyone. 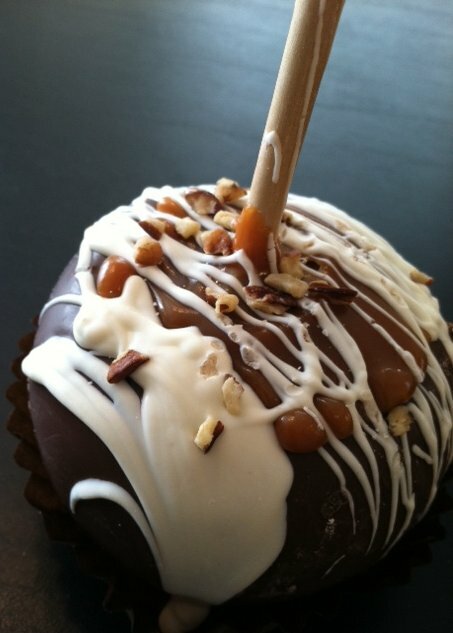 I absolutely adore caramel apples! 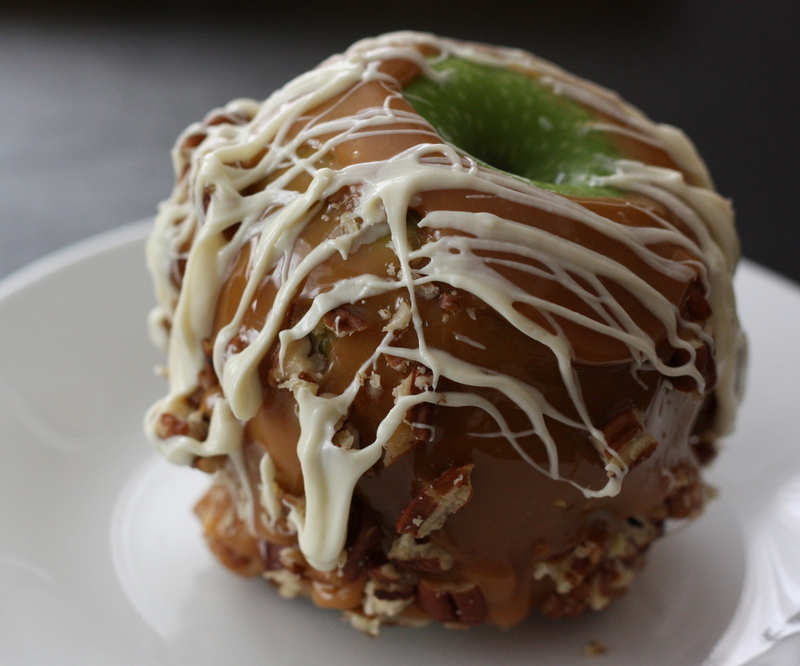 Caramel apples are my favorite autumn food (well, besides pumpkin chiffon pie). There’s just something about a tart apple covered in caramel, drizzled with white chocolate and coated with nuts or candy that creates instant happiness! So what’s the best song to go with caramel apples? “Don’t Sit Under the Apple Tree” sung by The Andrew Sisters, of course! Wash apples. Put sticks in them following directions on caramel apple sticks package so you do not skewer your hand. Refrigerate. Prepare plates of various toppings you want to use to coat the caramel apples and set aside on a large table. Divide caramels into piles of 9-10 caramels each. Give each person a medium sized microwaveable bowl. Have each person take a pile of caramels, unwrapping them into the bowl, and throwing away plastic wrappers. Put 1 teaspoon water in each individual bowl with unwrapped caramels. Microwave each bowl separately on power 4 gently stirring every 20 seconds for about 1 minute and 20 seconds. Remove tray of apples from the refrigerator. Pool caramel to the side of the individual bowl. Set apple on its side in caramel and twirl it until it is coated in a swath across the middle of the apple. Immediately roll apple in pecans, toffee bits, etc. 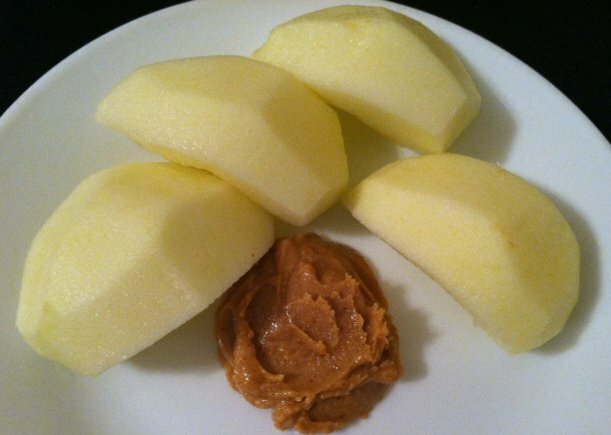 On a small microwaveable plate, melt 2 tablespoons white chocolate chips per apple. DO NOT ADD ANY WATER to these white chocolate chips. With a fork, drizzle over the top of the apple and down the sides to cover any "defects" in caramel coverage.